Spinal stenosis is a compromise of the spinal canal as the volume of it decreases, typically with age. Each person's spinal cord size and canal size is different, and so the risk factors also vary. Onset of spinal stenosis is often gradual and worse with movement. Several options, including chiropractic care, are available as an option before surgery. The spinal column differs in measurements between men and women. The spinal cord runs from the very top of the neck at the C1 vertebrae to the beginning of the low back at the L1 vertebrae. The rest of the way down the spine is occupied by nerves that run out into the low back and lower body. Surrounding the spinal cord and vertebral column the entire length of the spine is fluid called cerebrospinal fluid. It is when this fluid starts to decrease that extra pressure is put on the spinal cord and nerve roots, resulting in the neurogenic pain that people with this condition feel. The onset is usually gradual as fluid volume decreases over time. Those who suffer from spinal stenosis often have a long history of spinal pain and/or injuries to the spine. The symptoms of spinal stenosis typically begin in the legs and can become much worse with walking or exercise. This leg pain while walking is called neurogenic claudication. The diagnosis of neurogenic claudication can often be hard to differentiate from vascular claudication, which is when the blood supply to the legs is poor and unable to support the tissues and muscles of the leg. Walking uphill is usually better for those with neurogenic claudication because it bends the spine forward while walking. Walking downhill is much more difficult because it arches the spine in the back and pushes the spinal cord closer to the vertebrae, often causing increased symptoms. A thorough exam and history is vital to the diagnosis and differentiation of spinal stenosis. A classic sign of neurogenic claudication is stooping forward or bending down to stop the pain after walking. This differs from vascular claudication in that just stopping movement will often relieve the symptoms. The clinical diagnosis can be confirmed by looking at the canal space using CT, CT myelography, and MRI. If denervation is suspected, electromyography may also be confirmed. 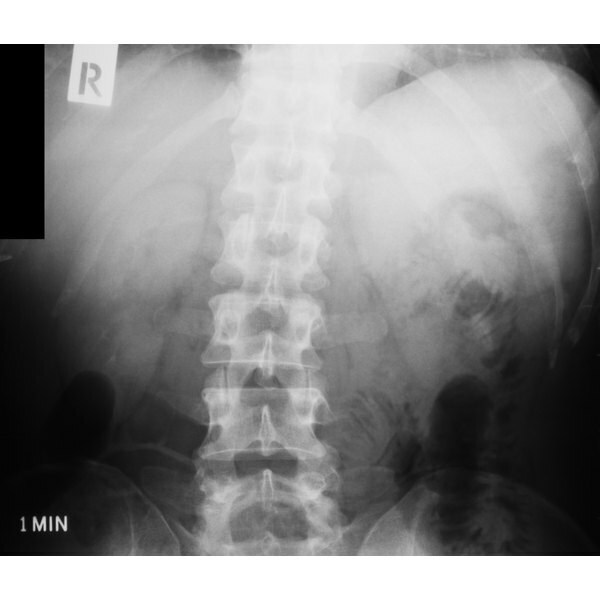 It should also be noted that the spinal canal is not visible on X-ray. Degeneration of the spine and evidence of subluxation can be noted on X-ray, which would contribute to symptoms experienced by spinal stenosis. Typically, the treatment in the past has mostly been composed of surgery for people who suffer from spinal stenosis. This is starting to change slightly as more physicians are recommending alternatives to surgery first. A very popular alternative is chiropractic care. Chiropractors focus on something that is called a subluxation of the spine, which is when a vertebrae doesn't move as well as it should, and as a result the bone and surrounding tissue structures put pressure on the nerves and spinal cord. Over time, as there is lack of motion in the spine, the disc spaces between the bones start to decrease. As the discs decrease, arthritis sets in to stabilize that area, which complicates things for people who are already susceptible to spinal stenosis. A chiropractic adjustment balances out the nervous system, gets the joints moving again and often times leads to a reduction in the symptoms experienced by spinal stenosis. Utilizing flexion-based exercise programs along with the chiropractic adjustment has also been utilized successfully. The degree to which chiropractic care works to alleviate spinal stenosis is compounded by several factors. There is a limitation of matter and time that has to be taken into account when looking at chiropractic care. If there has been a problem in an area for several years, it may take time for the body to heal that area. The number of health issues a person had in addition to the spinal stenosis may also lead to poorer outcomes. These co-morbidities along with being female and the degree of spinal cord narrowing are the leading precautions when looking at chiropractic outcomes to spinal stenosis. Doug Endel is a health and fitness writer and chiropractor who practices in Seattle a very specific form of chiropractic called Blair. He studied biomedical engineering while running track at the University of Cincinnati and then went to Palmer College of Chiropractic in Iowa where he got into longer distance running and triathlons.